Josephine is the personification of ageless style. 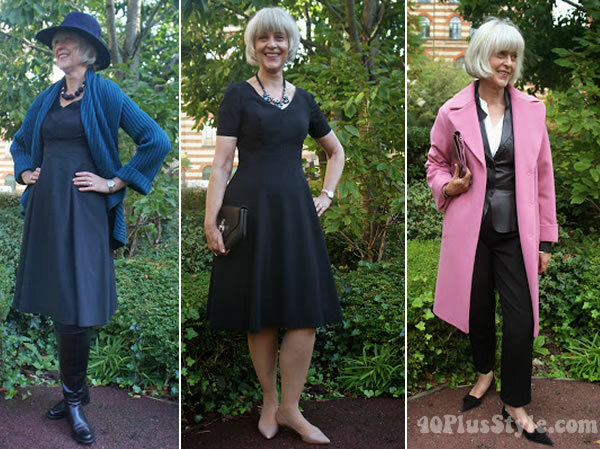 Befitting her blog title Chic at any age, she always looks elegant and indeed very chic. Taking inspiration from the UK and France she combines the best of both worlds into her effortless style. Time to ask her a few questions and find out how she stays so effortlessly chic! My priorities and passions in life are primarily my family, continuing to learn, to express my creativity through my blog and to live my life with a sense of style and joy. 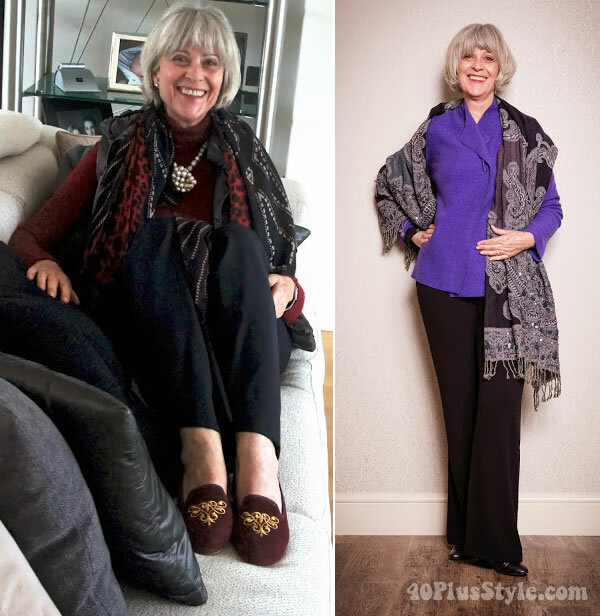 I started my blog at 50+ and the blog and I continue to flourish at 60+. Can you tell us a bit more about your blog Chic At Any Age and why you created it? I had been working as an Image Consultant and coach, primarily in the Corporate market for over 20 years. When I decided to scale back my traveling and work commitments I created my blog in 2010 as I strongly believe that at whatever decade in life we find ourselves in we can continue to look chic and enjoy fashion. It was originally called Chicat50+ however I soon discovered that my nieces who are in their 40s followed the blog so the name evolved into “Chicatanyage”. I believe you both live in the UK and France. Can you tell us a bit more what you like of each place and how these places influence your style? I have lived in London for well over 30 years now so I do consider myself a Londoner. London has a strong sense of history and culture whilst at the same time buzzing with innovation and creativity. I do tend to dress more formally in London and wear neutrals such as grays and navies. I find the South of France more relaxed and laid back. When there I tend to wear brighter colors and lighter fabrics. St. Tropez itself is very glamorous during the season with a distinctly hippy vibe. I would describe my style as elegantly classic. I keep the shapes simple and add interest with scarves, jewelry, bags and hats. I like to mix my classics with one or two contemporary pieces. How important is style consistency for you? I would say that an element of style consistency is important. However I like to think that my style slowly evolves as I update my wardrobe. This allows me to keep my style fresh and vibrant. I am obsessed with fit and comfort. I always make sure that my clothes fit well which often involves a trip to my marvellous alterations woman. Also the fabrics I choose need to be comfortable and have movement. I am inspired by films, maybe a piece of art or more recently elegant role models of a similar age. Yes, definitely as I trained and worked as an Image Consultant I find that the principles of body shape and flattering colors have become part of my DNA. I feel that my style has been influenced more by lifestyle and practicality. While I was working in a corporate environment my “look” was more formal. 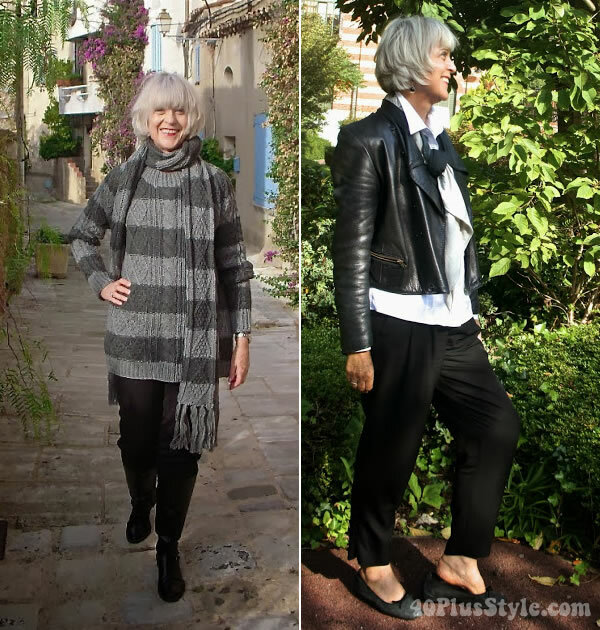 Now that I work mainly from home, spend more time with my grandchildren and about 3 months of the year in France my wardrobe has become more casual. I believe more in “appropriate dressing”. By that I mean to have the courtesy to dress with the occasion and other people in mind as well as oneself. If you have a great body by all means show it off to its best advantage and at a certain age that usually means focusing attention upwards to the face and a joyful smile. Elegance and discretion is key in my book. I have always had an interest in fashion from an early age. My mother was my first role model. She always dressed very elegantly. 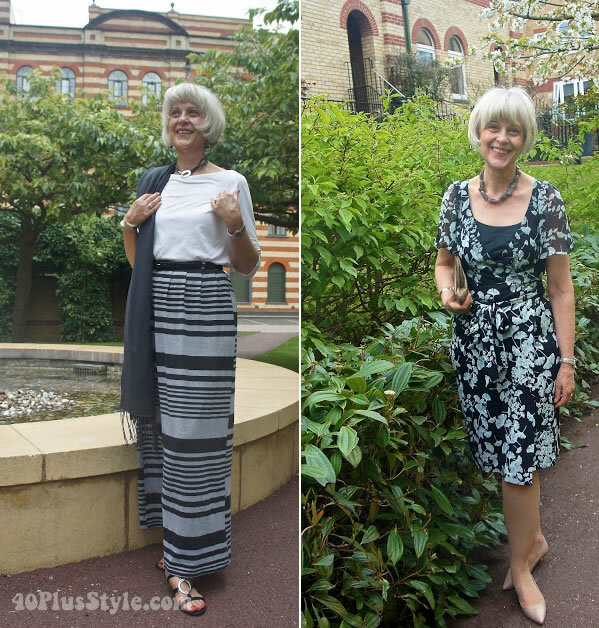 My various careers have all had some connection to fashion from fashion PR to Image Consultancy and now as a fashion blogger. The way you dress is not who you are however it is an outward expression of who you are and as such is worth the attention and effort involved in looking “soignée”. Which of the outfits on your blog are personal favourites and why? I currently love my M&S pink winter coat. It lifts my spirits every time I wear it. Also a simple long black dress that I accessorise with a belt and hat for the summer and bold jewelry for the evening. It is very versatile and has a St. Tropez feel. I do keep an eye on trends and adapt them to my “look”. At the moment I love the new over the top statement necklaces – Zara do some great ones. Also the oversized coats that are around this season. Don’t make a purchase unless you absolutely love the item and it makes you feel fantastic when you wear it. I am a great believer in less is more. Buy the best you can afford and enjoy wearing it. My blog started as a creative hobby and I am thrilled that it has been so well received and attracted international publicity. I intend to continue to grow my blog and possibly to cultivate opportunities to use my previous experience in running seminars and conference speaking to raise the profile of women of a certain age and contribute to us all becoming more visible. 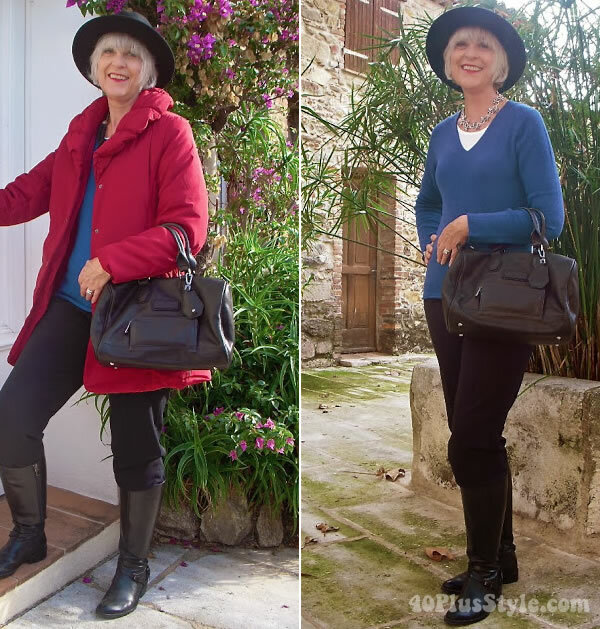 I am a great fan of your blog and consider you are doing great work to inspire women over 40 to continue to evolve and enjoy their individual style. It was great to find out more about Josephine and her style choices. Don’t forget to check out her fabulous blog Chic At Any Age. Josephine knows how to dress in a clean and classic way that is inspiring. I’ve noticed her blog and love the way she styles her beautiful hair. Fun to learn more about her. I love the asymmetrical purple top over skinny black pants. Purple certainly is a great color on Josephine. I also appreciate that she has beautiful white hair and is not attempting to color it. Beautiful! Somehow she reminds me of myself. There are outfits in her range that I could have put together. Like the purple top over the black skinnies (love that). Or the long black and white striped skirt with the white top. Or that perfect pink coat. All things I would love to have. Another wonderful interview Sylvia. A big thank you is due you. I have met so many fabulous women over 40 via your incredible website. Josephine is a real gem and her advice is right on. I have begun reading her blog archives and really enjoy her writings. Every look featured here is fantastic, and I love her hair. I’m seeing more and more women keeping their grey, or going for very minimal highlighting and am so happy about that. Makes me feel like a trendsetter…LOL! Next post: How can a punctual person be always late all of a sudden?